Iran's prosecutor general said Wednesday there would be no repeat of women watching football matches inside stadiums, saying it would "lead to sin". The comments by Mohammad Jafar Montazeri came a day after around 100 women were allowed to watch their country take on Bolivia in a friendly at the national stadium -- an extremely rare step in the Islamic republic. 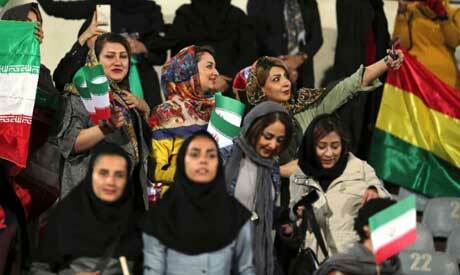 "I object to the presence of women in Azadi Stadium yesterday. We are a Muslim state, we are Muslims," Montazeri said, according to the conservative Mehr news agency. "We will deal with any official who wants to allow women inside stadiums under any pretext," he added. "When a woman goes to a stadium and is faced with half-naked men in sports clothes and sees them it will lead to sin." Women have been barred from attending matches since the 1979 Islamic revolution, with clerics arguing they must be protected from the masculine atmosphere and sight of semi-clad men. They have also worried about the crush of men and women when leaving stadiums. There had been reports that women would also be allowed to attend the return match of the 2018 AFC Champions League semi-finals on November 23, but Montazeri warned sports officials that he would not allow it. "If this is repeated I will order the Tehran prosecutor to act," he said.